Mt. Baker, in Washington’s north Cascades, possesses some of the most-renowned backcountry terrain in the U.S., yet its location deters large crowds. 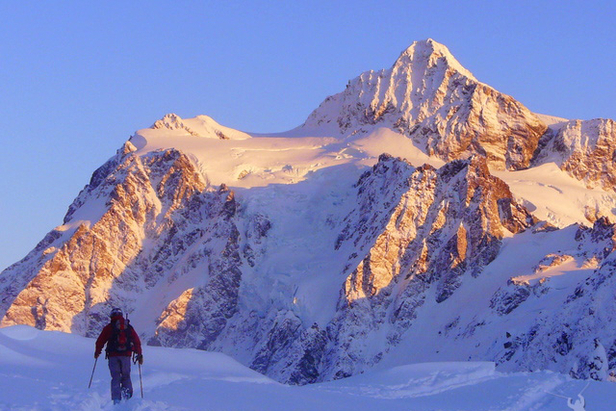 The majority of tours are best suited for strong intermediate to expert backcountry travelers. The mountain, perpetually cloaked in white, is a heavily-glaciated volcano with massive vertical relief. It tops out at 10,781 feet and offers virtually limitless terrain options. The area is renowned for its deep snowpack, and the nearby [R266R, Mt. Baker Ski Area] holds the world-record for snowfall in one year—95 feet of accumulation—set during the 1998/1999 season. The Mt. Baker backcountry extends from Mt. Shuksan on the east to Mt. Baker on the west and includes the connecting ridges of Shuksan Arm and Ptarmigan Ridge in between. The mountain has expansive glaciers, powder bowls, technical couloirs, powder-filled glades and plenty of lower elevation trees. Most ski routes begin at 2,800 to 4,200 feet and average 15 miles roundtrip; many routes begin directly from the Mt. Baker Ski Area—just park and tour. Mt. Baker is usually skiable year-round though it can become heavily crevassed in the summer. Highly recommended ski routes include Easton Glacier (intermediate/advanced), Coleman/Deming Glaciers (advanced) and Ptarmigan Ridge/Sholes Glacier (intermediate/advanced). From Seattle, drive 90 mile north on I-5 to Bellingham or fly directly to Bellingham International Airport. Bellingham, 30 miles due east of Mt. Baker, has all your outdoor gear needs and plenty of lodging as well as nightlife options.